Spring development as a clean water source may be an option when natural springs are located nearby. A spring or seep is water that reaches the surface from some underground supply, appearing as small water holes or wet spots on hillsides or along river banks. (See also "Groundwater" ). The flow of water from springs and seeps may come from small openings in porous ground or from joints or fissures in solid rock. Depression springs are formed when the land surface dips (forms a depression) and makes contact with the water table in permeable material. Water yield will be good if the water table is high, but the amount of available water may fluctuate seasonally. A gravity depression spring may not be suitable for a drinking water source since it may dry up. Contact springs are formed when downward movement of underground water is restricted by an impervious underground layer and the water is pushed to the surface. This type of spring usually has a very good flow throughout the year and is a good water source. Fracture and tubular springs are formed when water comes from the ground through fractures or joints in rocks. Often the discharge is at a single point and protection is relatively easy. Fracture and tubular springs also offer a good source of water for a community supply. Artesian springs occur when water is trapped between impervious layers and is under pressure (see "Groundwater" ). There are two types of artesian springs: fissure and artesian flow. Artesian fissure springs result from water under pressure reaching the ground through a fissure or joint. Yield from Artesian spring development will be very good and this source is excellent for a community supply. Artesian flow springs occur when confined water flows underground and emerges at a lower elevation. This type of spring occurs on hillsides and will also offer an excellent supply or water. Before reaching the surface, spring water is generally free from harmful contaminants. To avoid contamination, the spring should be protected at the point where the water leaves the ground. There are two basic types of intakes for spring development and collecting water from springs and seeps. The first, and easiest to install, is the spring box. A small area is dug out around the spring and lined with gravel. 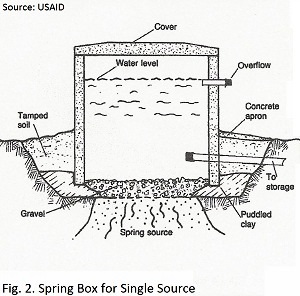 A concrete box with a removable cover is placed over the spring to collect and store the water. The cover prevents contamination and should be heavy enough to keep people from removing it to dip buckets and cups into the collection box. A tap and an overflow to prevent a back-up in the aquifer should be installed. 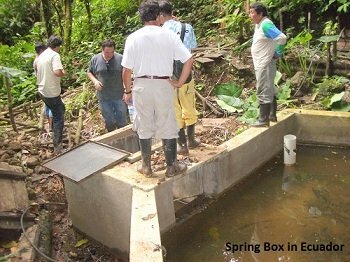 For springs that flow from one spot on level ground, an open-bottomed spring box should be placed over the opening to capture all available flow. 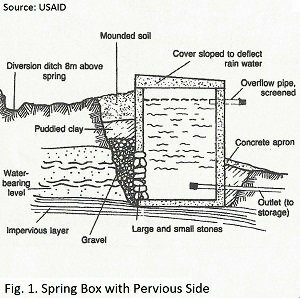 For spring development on a hillside, a box with an open back should be placed against the hillside and the water should be channeled into the collection box. See Figures 1 and 2 for examples of these types of spring collection. Intakes for seeps and some springs can be perforated plastic or concrete pipe placed in trenches or collection ditches. The trenches are deep enough so that the saturated ground above them acts as a storage reservoir during times of dry weather. Generally, the trenches should be 1 meter below the water level. Collection pipes are placed in the trenches which are lined with gravel and fine sand so that sediment is filtered out of the water as it flows into the pipes. Clean, clear water flows from the collection pipes to the storage or collection box. See Figure 3 for an example of a spring box with collection pipes. For spring flows that cover a wide area, a concrete wall should be installed to collect all flow. The cost of spring development is minimal and the system is relatively maintenance free. Disinfection of fresh spring water may not be required, but is always recommended. Since springs are generally located on hills, a simple gravity flow delivery system can be installed. A disadvantage of spring development is that the quantity of available water may change seasonally. Local community members should be consulted as to the reliability of the source. Where a spring has a steeply sloping water table (steep hydraulic gradient), horizontal wells may be used for spring development. Horizontal well intakes must be located in an area with a sloping water table in order to have adequate discharge. Pipes with open ends or with perforated drive points or well screens can be driven, jetted, or augured into an aquifer horizontally or at a shallow slope to tap it at a point higher than the natural discharge. The pipe must also enter the aquifer deeply enough to ensure the required minimum flow throughout the year. The water supply reaches the surface by flowing from the tapped aquifer through the installed pipe. See Figure 4 for an example of intake placement for horizontal wells. Horizontal wells are installed in a manner similar to driven and jetted wells except that care must be taken to prevent water from flowing through the annular space outside the pipe. Any flow can be stopped by grouting or by constructing a concrete cut-off wall packed with clay backfill. The advantages and disadvantages of spring development of this type are similar to those of the spring box mentioned above. Horizontal wells are fairly inexpensive, spring water is relatively clean, and gravity flow may be acceptable. Springs with flat water tables are not suitable for the use of horizontal wells, and the quantity of water may fluctuate with the season. 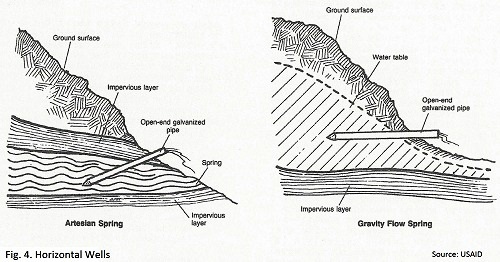 If water seeps from the ground and covers an area of several square meters, a third method may be used. 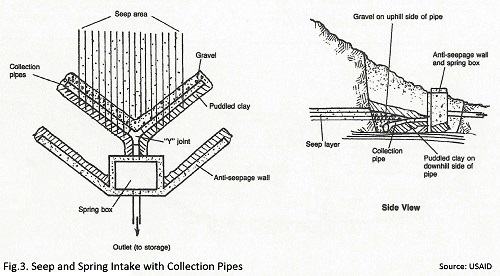 Pipes can be laid to collect the underground water and transport it to a collection box as shown in Figure 3. A poured concrete wall just downslope of the pipes can trap the water for more efficient collection. With this seep water collection method, maintenance costs are higher as pipes often clog with soil or rocks. Also, the expense and difficulty of construction may prohibit its use. Unless the seep supplies abundant quantities of water, this method should not be considered. Swiss Centre for Development Cooperation in Technology and Management (SKAT) has published a manual entitled "Spring Catchment" which covers additional topics and information on the subject of spring development. The PDF of that manual can be downloaded here. Return to "Surface Water" from "Spring Development"